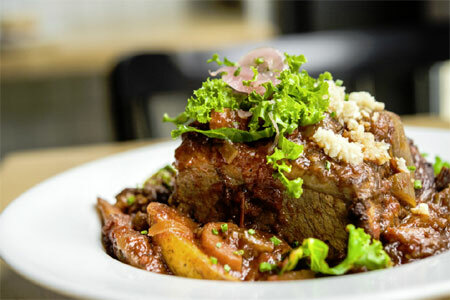 A 19th century-themed drinking spot with hearty food to match. 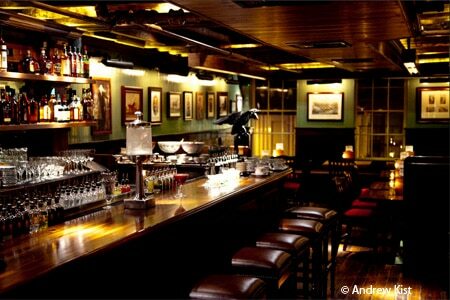 : Take a step into the 19th century upon entering the Dead Rabbit, a multi-level cocktail bar and eatery in lower Manhattan that draws inspiration from "the conviviality of Old New York and the Irish-American tradition." Skilled bartenders mix up potent, inspired concoctions, and there's also a lengthy Irish whiskey selection. And don't count out the food. Dishes like crispy pork belly sliders, Scotch eggs and the decidedly non-nineteenth century (but ultimately satisfying) lamb chop lollipops will not only fortify a night of imbibing strong cocktails, but alone justify the trip. There are also larger dishes such as fish and chips, bangers and mash, and Irish lamb stew. For dessert, choose between warm apple crumble or Bourbon pecan bread pudding.